I'm currently on my 33 weeks of pregnancy and almost getting closer and closer to my due date. Everyone is so excited to see our family expanding as well as the newest member-to-be. I still could not find the right gift to give to my beloved partner, after all he is also expecting with our second child. Looking for something that he can use during my labor and after at home or anywhere else is what I truly need. I'm happy to inform that Daddy & Co. have plenty of things online that can offer me on what to get for our expectant father. From Scrubs, hats, backpacks to accessories you think he will adore and used. Make sure when you avail the gift set, be more specific about the size of the person in order to prevent returns and exchange. All these items came in one nice box where you don't need to re-wrap the gift set. The products are made of a high quality material, they also have a wrist band included where you can choose if you're having a boy or a gift or if you are expecting a twin you've got the set. Aforestated the website would bring you a lot of things you can pick for the expectant daddy's. You can shop by the daddy style, shop by occasion, Daddy Daily or you can Shop All where you can find the New Arrivals, as well as the online Sales. Wait!!! 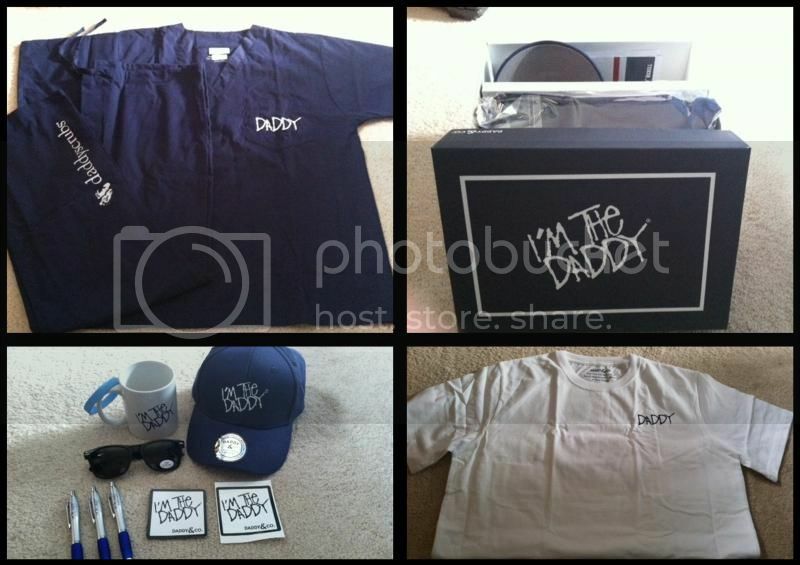 Daddy & Co. is giving away the same Daddy's Swag Gift Set to one of my very lucky winners. I'm hosting the giveaway with the courtesy of Daddy & Co. Company. The giveaway runs for the whole month and I will be picking up one lucky winner before our bundle of joy arrives. This is for US residents only, however if you knew your friend who are expecting within the US this would be one great gift for them. Definitely a perfect gift for your partner, or your friend's soon to be a daddy. Please visit their website @ Daddy& Co. to see more. Please don't forget to follow their social media Facebook, YouTube, Twitter and Pinterest and get an exclusive information or offer on their website. That is a nice collection, but I give nothing to the father. I give gifts for the BABY. Those are some great gifts. I wish I gifted something like that to my husband. This is new. Usually, it's the little one who gets all the presents. Dads should get goodies too and that's a nice gift set from Daddy & Co.
Haha this is cool - I didn't even know nor even thought of doing this haha! What a great idea...no one ever thinks of the poor dads! Awesome giveaway!!!! Thanks for sharing and keeping fingers crossed!!!! Very cute and thoughtful for dads. So cool! I'll be giving that cap to my brother. Great collections plus allows dads to be involved during the shower. Cute gifts, I love when the dad is included in the gifting process at baby showers! This is a great gift-set! It's nice when dads aren't being left out of the festivities. These are great for a new dad. It would be a fun gift. I've seen the Daddy Scrubs before (I love the concept), but had no idea they made other things. The Gift Set is very nice...and comes with a very useful collection of goodies for expectant dads. Very cute and clever gift set. So great to remember the dad to be! I know a few guys who would love to get this! I like that it's not too cutesy so the guys will like it. Great ideas! Sometimes daddy gets overlooked in all of the fussy for baby and mommy. However dad is just as important as mom. I think this is a wonderful idea! I think daddies should get presents too! I'm sure that would help him feel more included if he received it as a gift. It's an interesting idea. What a great idea! The expectant daddy can feel left out, fantastic post with options for the man of the house! These are super cute things! Dad-To-Be definitely deserves gifts geared towards him. We all tend to forget about the daddy and I think it is awesome you are thinking of daddy. This is an awesome giveaway I will have to share this with my niece who is going is two months pregnant. Thanks for sharing. Hahah, my wife got me this when we were expecting our daughter. Too bad we weren't allowed to bring our own scrubs to the hospital though! That's fantastic! My poor husband, with all six of our pregnancies I always felt so bad for him not getting much attention! AW!!!!!!! I love this! How fun! And geez, you're almost ready to pop! Congratulations! I just LOVE this set. I would totally gift it, neat idea. that's pretty neat...I love the whole set! I like this gift box. I have one and even though my husband isn't a new Dad, he wore the shirt lol. Congratulations to you and your hubby on the impending arrival of your baby! Yes you're almost there chica! Good luck to the winner of the raffle. Great gift especially if the recipient is a daddy-to-be. Awesome gifts for dads. What a good giveaway too. Now, daddies can still be fashionable as they expectantly wait for the new baby! It is a nice idea to give the daddy a new baby gift also. So often the daddy gets ignored when it comes to gifts. The Daddy Diaper Pack would be a perfect fit for my husband.